Only one version has thus far been located, some minor variations do exist, but they are not pictured below. Below you will find the standard version. "Messerschmidts darken the skies in front of you: JU-88 bombers move steadily toward their targets. At last, you've reached your objective - a fleet of U-boats with bad intentions. You dive in to make a bombing run, but you overshoot! 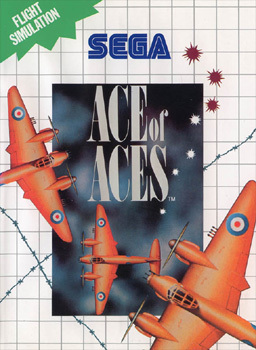 Turn around to try again, and the enemy fighters are all over you! Fire, dodge, climb, and fire again! 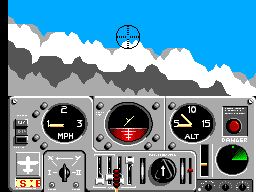 Your left engine is in flames, your fuel supply dwindling...can you weather the storm?" 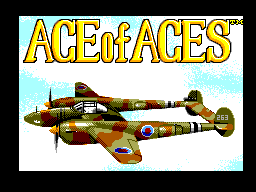 On the second title screen (the one with the airplane), after the Ace of Aces logo flashes, Press Up, Right, Right, Down, Down, Down, Left, Left, Left, Left, Up, Right, Down, Left. 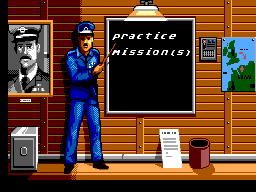 The game will automatically go to the mission select screen, and "Cheat Mode" will be visible. You will now have unlimited ammo. Information about the original game series at Board Game Geek.